Buying an exercise bike is a great way of helping you to stay in shape through the winter months. Let’s face it, when it’s cold and wet outside you don’t want to be running, cycling or even heading to the gym. Fortunately with the Sunny Health & Fitness SF-B111OS you don’t need to. In my opinion this is the best exercise bike under 500 for exercising. Exercise bikes offer a huge array of benefits, from improving your cardio, building strength in your lower body and even helping with weight loss. It’s also good on your joints and very convenient. You simply need to choose whether you prefer the recumbent style or the upright exercise bike. But the real reason that the Sunny Health & Fitness SF-B111OS is the best exercise bike under 500 is the fact that its fully adjustable and offers many of the features that you normally only get with the more expensive models. I’ve tried every exercise bike I could get my hands on for under 500 and am convinced the Sunny Health & Fitness SF-B111OS is the best of them all. 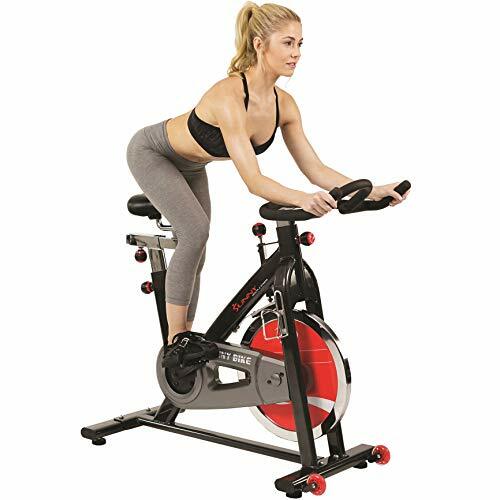 Sunny Health & Fitness have been in business for over 15 years and pride themselves on offering the best bikes and elliptical trainers for reasonable prices. 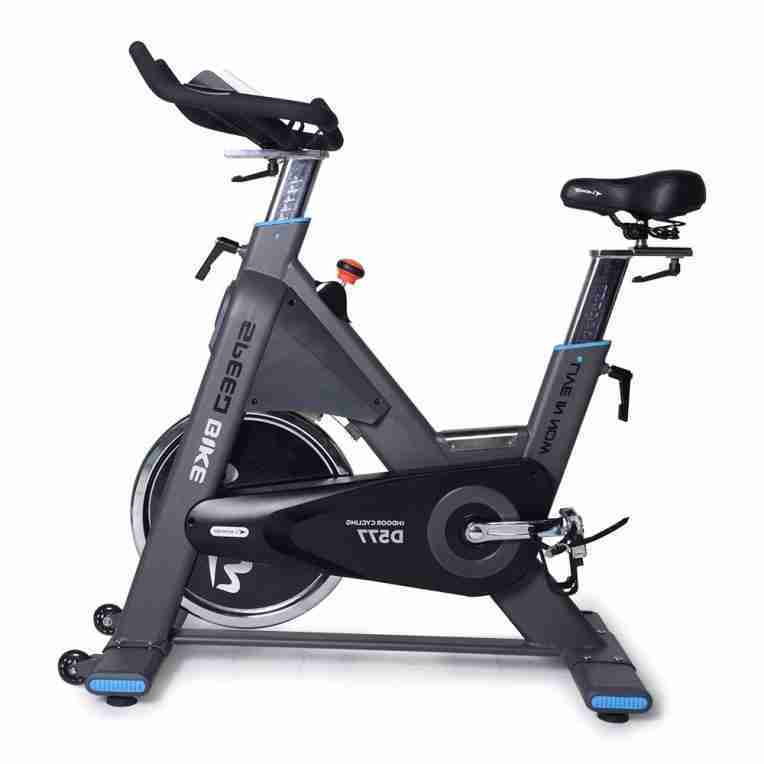 The Sunny Health & Fitness SF-B111OS, also known as the Indoor cycling bike; doesn’t disappoint. It’s a great option for anyone who loves cycling as it offers an experience very close to riding on the road. When you’re used to be in the saddle for an extended period of time you need to be comfortable. This is easy to achieve on the SF-B111OS as it is fully adjustable. The seat can be moved both up and down as well as back and forth; ensuring you can get the right position for your ride. The seat is also cushioned for comfort. More impressive is the fact that the handlebars move up and down and forward and back; there is absolutely no reason not to get comfortable on this bike. The resistance on the SF-B111OS is easily adjusted via a knob just below the handlebars. All you need to do is twist it to either increase or decrease the intensity of your workout. But that’s not all! There is also a fabric brake pad which is operated by a separate lever near the handlebars. This allows you to fine tune the resistance on your bike; creating realistic ups and downs which match those you would find if cycling on the road. The SF-B111OS uses a chain to drive the 44 pound flywheel. It is also exceptionally stable, allowing you to stand up while riding. Both of these factors help the bike to feel more like a road bike than an exercise bike. This can make your workout more challenging, exciting and rewarding. A great feature of this bike which is often overlooked by manufactures is the addition of wheels on the front bar. All you need to do is release the brake, grasp the handlebars and pull downwards. The bike will pivot onto the transportation wheels allowing you to slide it away virtually effortlessly. That’s a great way of keeping the space free. The bike is actually pretty quiet when riding; unless you want to crank the resistance up. This is particularly an issue if you’re using the felt brake as it creates a drumming sound. If you’re hoping to ride while watching television or with others in the room; this could be an issue. However if you’re planning on using it in a separate room with headphones and a music player or tablet then you probably won’t even notice the noise. Several customers have commented on the slow response by the customer service team at Sunny Health & Fitness. This is disappointing considering the company is dedicated to giving the best possible experience. Recumbent exercise bikes are a great way to keep exercising while recovering from back injury or even living with back pains. They are low impact and will still provide the same cardio benefits as an upright bike. Of course you won’t have quite the same feel of being on the road. Exerpeutic are actually a product of Paradigm Health & Wellness. They are considered one of the leading suppliers of fitness equipment in California. Their aim is to provide unique products through leading brands; the testimonies from their happy customers speak for themselves. The Exerpeutic 1000 High Capacity recumbent has a V-belt drive with balanced flywheel. This ensures the bike is smooth to ride and virtually silent. That’s impressive for a bike under 500. In addition there is a built in screen which shows your current speed, distance completed, calories burned, time working out and, most impressive of all; your heart rate. The heart rate monitor is built into the grips; allowing you to check and monitor it whenever you want. Recumbent bikes are generally considered the best option if you have a bad back or joint pain. For this reason the Exerpeutic 1000 High Capacity recumbent has a step through design; making it easy for anyone to get on and off. You’ll also appreciate the extended leg stabilizers and large pedal design; helping you to pedal without your feet slipping. This helps to lower the centre of gravity and keep the bike stable when you’re pedaling. The seat on this bike is well padded to ensure you remain comfortable while pedaling. It can be adjusted back and forth. It is worth noting that the back rest doesn’t move; this shouldn’t be an issue but could affect your comfort levels. Overall the Exerpeutic 1000 is a well thought out bike. This is why it is disappointing to note that there are only 8 resistance levels. This is acceptable for a beginner but if you have any experience on a bike you’ll probably find that there are not enough settings to give you the workout you really want. It’s also disappointing to note that despite having an electronic display the resistance needs to be adjusted manually via the knob. It’s not easy to do while cycling. The BladeZ Fitness Fusion GS II is a beautiful looking bike with a lot of great features. Unfortunately it doesn’t offer the same feel of being on the road as the Sunny Health & Fitness SF-B1110S. BladeZ Fitness is actually a European company which has been producing exercise and fitness equipment for over 100 years! Their aim is to produce high end equipment for the home and light commercial settings but at affordable prices; they’ve certainly hit the right note with this entry to the best exercise bike under 500. The BladeZ Fitness Fusion is made from heavy duty steel. This does make it heavier to move round but it ensures it remains stable even in the most energetic of spinning classes. The current version of this bike features an improved handlebar post and handlebars; this ensures they are strong enough to take a heavy duty workout. There is a 40 pound flywheel to give you enough resistance while keeping the bike feeling smooth and stable. As a bonus the bike comes with a comprehensive warranty. The first thing you’ll notice is that the seat adjusts in 4 different directions and the handlebars also move. This will virtually guarantee your ability to get comfortable while riding it. But that’s not all. The BladeZ Fitness Fusion also has a variety of different hand position options; thanks to the extended length and shape of the handlebars. This is so that you can change your grip as necessary to match your spinning workout. You’ll probably also notice the seat is thin and long; similar to a road bike. It is actually surprisingly comfortable. You do get a manual adjusting knob for the resistance levels on this bike. However, this is an infinite resistance style adjuster. You can keep turning it to make it harder and harder, (or easier). It’s easy to do this while riding and you can push the knob in to release all tension; effectively creating an emergency stop feature. The LCD console sits above the handlebars, ensuring you can see it at all times without it getting in the way. You have the usual display options, distance, calories burned, speed, time and a scan feature. It doesn’t monitor your heart rate. This is a well put together bike with an electronic console and yet there are no workout programs to help you make the most of each session. This may not be a deal breaker but it is certainly disappointing. Several people have noted that if you are less than 5’2” you’re likely to struggle reaching the pedals, handlebars and controls; despite the array of handlebar and seat adjustments possible. Finally while most people are happy with the seat anyone who is not accustomed to hard riding is likely to find it uncomfortable; which could prevent you from completing the whole workout. Choosing the best exercise bike under 500 is easy thanks to the above guide. There are hundreds of options on the market but you’ll struggle to beat the Sunny Health & Fitness SF-B1110S for sheer authentic and enjoyment. This bike offers everything you could need from an exercise bike to keep you motivated and improving your fitness right though the winter months. 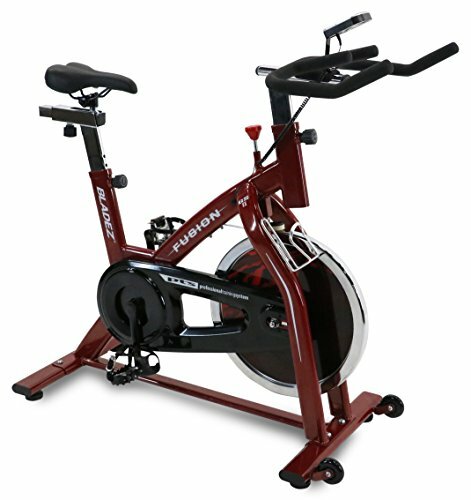 The quality of its build and the small details like full adjustability make it the best exercise bike under 500 currently available. You really will feel like your outside when you’re actually safe and warm in your own home. I’ve added this bike to my collection and couldn’t be happier with the choice.